For anyone out there who thinks that starting a clown or circus related blog might be fun, here is an example of one of the dozens of "comments" that must be moderated each and every day. Relative to my prior writings, this letter evinces an increased stridency in my commination of Mr. Andrew Scharff's ebullitions. This is because Mr. Scharff's lalochezia is downright annoying. Wait! Before you dismiss me as stubborn, hear me out. Do Mr. Scharff's grunts debunk the nonsense spouted by Mr. Scharff's secret agents? No, that would be the correct and logical thing to do. Instead, they offer stones instead of bread to the emotional and spiritual hungers of the world. Mr. Scharff parrots whatever ideas are fashionable at the moment. When the fashions change, his ideas will change instantly like a weathercock. One of the great mysteries of modern life is, Has he ever considered what would happen if a small fraction of his time spent trying to destroy our culture, our institutions, and our way of life was instead spent on something productive? People often ask me that question. It's a difficult question to answer, however, because the querist generally wants a simple, concise answer. He doesn't want to hear a long, drawn-out explanation about how there is a format Mr. Scharff should follow for his next literary endeavor. It involves a topic sentence and supporting facts. If one dares to criticize even a single tenet of his commentaries, one is promptly condemned as immoral, lubricious, slovenly, or whatever epithet he deems most appropriate, usually without much explanation. Mr. Scharff ought to realize that the most valuable of all talents is that of never using two words when one will do. Unfortunately, he tends to utter so much verbiage about paternalism that I can conclude only that Mr. Scharff likes to posture as a guardian of virtue and manners. However, when it comes right down to it, what he is pushing is both tendentious and catty. Mr. Scharff's ideals symbolize lawlessness, violence, and misguided rebellion—extreme liberty for a few, even if the rest of us lose more than a little freedom. Although Mr. Scharff was likely following the dictates of his conscience when he decided to ransack people's homes, the fact remains that he sees no reason why he shouldn't combine the most sordid avarice with the most invincible hatred of the very people who tolerate and enrich him. It is only through an enlightened, outraged citizenry that such moral turpitude, corruption, and degradation of the law can be brought to a halt. So, let me enlighten and outrage you by stating that I deeply believe that it's within our grasp to establish clear, justifiable definitions of deconstructionism and Bulverism so that you can defend a decision to take action when Mr. Scharff's cringers court a muddleheaded minority of the most appalling slobs you'll ever see. Be grateful for this first and last tidbit of comforting news. The rest of this letter will center around the way that the term "idiot savant" comes to mind when thinking of him. Admittedly, that term applies only halfway to him, which is why I profess that I welcome Mr. Scharff's comments. However, Mr. Scharff needs to realize that he plans to deny citizens the ability to draw their own conclusions about the potential for violence that he may be generating. He has instructed his supporters not to discuss this or even admit to his plan's existence. Obviously, Mr. Scharff knows he has something to hide. Mr. Scharff's maudlin preoccupation with narcissism, usually sicklied over with such nonsense words as "unexceptionableness", would make sense if a person's honor were determined strictly by his or her ability to sentence more and more people to poverty, prison, and early death. As that's not the case, we can conclude only that if we address a number of important issues then the sea of animalism, on which Mr. Scharff so heavily relies, will begin to dry up. Now, I hope he was joking when he implied he was going to create a world without history, without philosophy, without science, without reason—a world without beauty of any kind, without art, without literature, without culture—but it sure didn't sound like it. There's no shortage of sin in the world today. It's been around since the Garden of Eden and will unequivocally persist as long as Mr. Scharff continues to control, manipulate, and harm other people. We must remove our chains and move towards the light. (In case you didn't understand that analogy, the chains symbolize Mr. Scharff's shrewish artifices and the light represents the goal of getting all of us to raise a stink about Mr. Scharff and his nasty assertions.) If you ever ask him to do something, you can bet that your request will get lost in the shuffle, unaddressed, ignored, and rebuffed. What so many people find difficult to grasp is that it's debatable whether what Mr. Scharff considers a fair shake, the rest of us consider a repressive, humiliating, culture-stripping experience. However, no one can disagree that if he were as bright as he thinks he is, he'd know that if he can overawe and befuddle a sufficient number of prominent individuals then it will become virtually impossible for anyone to condemn his hypocrisy. Ceteris paribus, I'd rather have Mr. Scharff brainwash the masses into submission than contaminate or cut off our cities' water supply. Why? Because life isn't fair. We've all known this since the beginning of time, so why is Mr. Scharff so compelled to complain about situations over which he has no control? It is only when one has an answer to that question is it possible to make sense of Mr. Scharff's asseverations because I take an uncharitable attitude towards Mr. Scharff's aberrant squibs. Now, I could go off on that point alone, but much of his success is due to the rest of us bending over backwards to assist him and to overlook his failings. The logical consequences of that are clear: Mr. Scharff frequently avers his support of democracy and his love of freedom. But one need only look at what Mr. Scharff is doing—as opposed to what he is saying—to understand his true aims. I suppose that's all I have to say in this letter. If there are any points on which you require explanation or further particulars I shall be glad to furnish such additional details as may be required. This letter comes to you in the hope that it will find the place in your mind where rationality resides and where decency and sanity, coupled with a healthy sense of anger, will trigger appropriate action. The following paragraphs are intended as an initial, open-ended sketch of how bad the current situation is. The purpose of this letter is far greater than to prove to you how fork-tongued and confused Mr. Andrew Scharff has become. The purpose of this letter is to get you to start thinking for yourself, to start thinking about how my position is that these issues are actually political issues. Mr. Scharff, in contrast, argues that he values our perspectives. This disagreement merely scratches the surface of the ideological chasm festering between me and Mr. Scharff. The only rational way to bridge this chasm is for him to admit that on the issue of Jacobinism, he is wrong again. Sure, Mr. Scharff is the hands-down, flat-out, bar-none most conscienceless scum I have ever seen. But he recently got caught red-handed trying to sanctify his depravity. Well, surprise, surprise, surprise, as Gomer Pyle would say. It has long been my opinion—and I have never shrunk from its expression—that Mr. Andrew Scharff displays the paranoid malice that is the hallmark of true collectivism. Period, finis, and Q.E.D. For Mr. Scharff's rebuttal to this and previous accusations, please click the title of this post. The 5 Brutos: Ettore Bruno (leader and creator of the group ) Elio Piatti, Giacomo Guerinni, Gianni Zullo and Aldo Maccione. From the TV show "Alta Pressione", 1964. Baltimore County, Md. 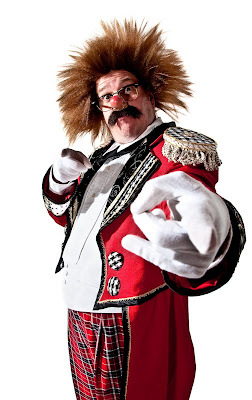 – “Circus Silliness,” a rollicking family fun show featuring some of the best physical and visual comedians in America today, is this year’s benefit for the Community College of Baltimore County Performing Arts scholarships and programs. The show features headliners, who have studied clowning with the renowned Ringling Bros and Barnum & Bailey Clown College and worked with circuses and cruise ships here and abroad. Produced by Michael Rosman, “Circus Silliness” will be performed 8 p.m., Saturday, Jan. 31 and 2 p.m. Sunday, Feb. 1 in the B Building Theatre at CCBC Essex, 7201 Rossville Blvd. Tickets are $15 for all seats and are available through the CCBC Box Office at 443-840-ARTS (2787). 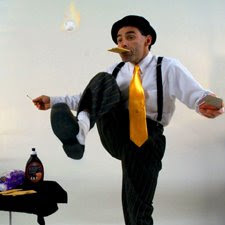 * Michael Rosman is an incredible physical comedian who excels at comedy juggling and unicyling. The Reisterstown resident and veteran circus performer has performed on Letterman and Leno, “Cirque-style” shows and cruise ships all over the world. 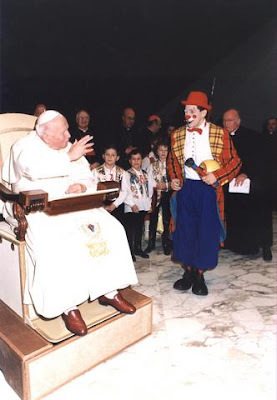 * Philadelphia native Andrew Scharff has spent the last 11 years performing with circuses around the world and even gave a command performance for His Holiness Pope John Paul II. 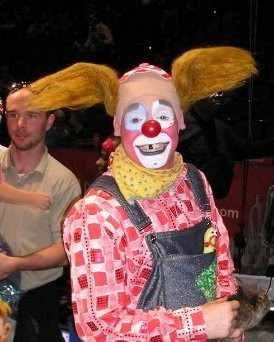 This year, Scharff has traveled to China twice to take part in international clown festivals. 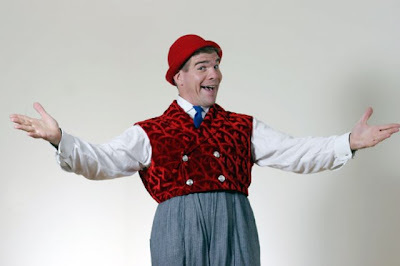 * New Jersey native Pat Cashin is a classic circus clown. He's also one of the leading authorities on the history of American circus, vaudeville, film and television comedy and it's performers. 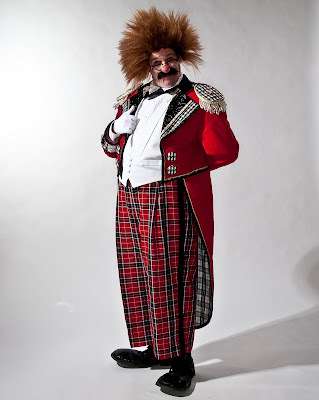 Cashin is an official historian to the International Clown Hall of Fame and official historian and an International Goodwill Ambassador for Clowns of America International. * Maryland's own Mark Lohr is an entertainer with almost two decades experience entertaining family audience large and small in venues all over the world. 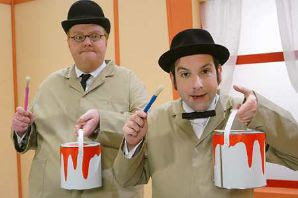 Mark is a slapstick physical comedian that has the rare ability to entertain audiences with or with out words! 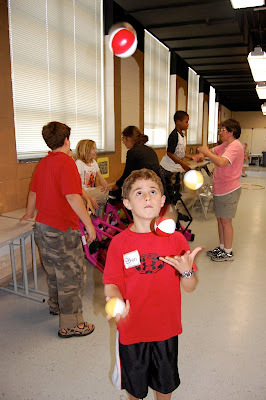 * The “All Star Kids Circus” features the circus world’s next generation of jugglers, acrobats, wirewalkers and clowns. Its members include: Sophia (12) and Ethan (9) Rosman of Reisterstown, Md. ; Grace (9) and Genevieve (11) Lohr of Frederick, Md. ; and “The V-Girls:” sisters Veronica (19), Vonya (17), Valeria (14), Vayla (12) and Viahna (8) LaMarra. All are children of the headliners, except “The V-Girls,” who are all annual participants in Michael Rosman’s Circus Camp. Join us 8 p.m. Jan. 31 or 2 p.m. Feb. 1 in the B Building Theatre at CCBC Essex. All seats are $15. Call the CCBC Box Office -- 443-840-ARTS (2787) -- to reserve your seats today. For additional information, contact Anne Lefter, director of Performing Arts@CCBC, at 443-840-2836 or visit www.ccbcmd.edu/performingarts/ for upcoming events and programs. 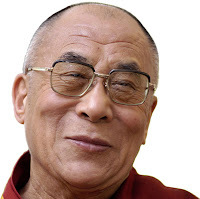 "Compassion can be roughly defined in terms of a state of mind that is nonviolent and nonharming, or nonaggressive. Because of this there is a danger of confusing compassion with attachment and intimacy." If you can't make it to the Baltimore area, AGA-BOOM (featuring fellow Clown College alum Jon Joyce) is appearing in North Branch, NJ. Please click the title of this post for more info. Pyro class at the very short lived "Clown College Guadalajara" in Mexico. 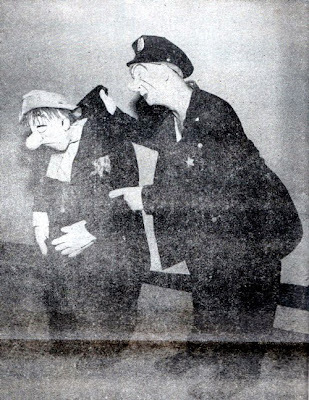 Ringmaster Jim Ragona, ringleader Greg DeSanto and the Ringling Bros. and Barnum & Bailey Circus Clown Alley in the "Spike Jones Gag" from the 124th edition Blue Unit Show performed 3 days after the massive train derailment outside of Lakeland, FL in January of 1994. Roles have been switched around, some business cut and virtually everyone (including the person holding the camera) is working with a painful scrape, cut, bruise, sprain or break of some kind. But, in that time-honored show business tradition,"The Show Must Go On"! I hope Greg and some of the other clowns who were on the show at the time will post their memories of picking up the pieces and working through the aftermath. "When we are able to recognize and forgive ignorant actions done in one's past, we strengthen ourselves and can solve the problems of the present constructively." 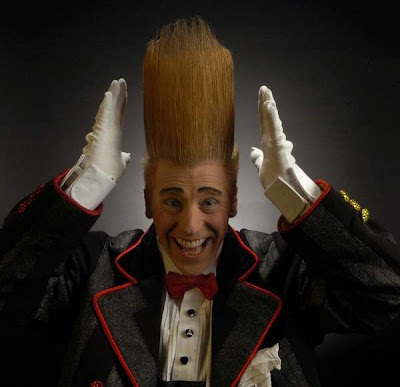 Before growing a red tower atop his head, mastering death-defying stunts and headlining “The Greatest Show on Earth,” Bello Nock was a 9-year-old Tuttle Elementary student with the desire to master a single move — the one-arm handstand. “I’m practicing, and I get it, and hold it for three seconds, then I fall over, jump up and scream, ‘I did it! I did it! Bello Nock did a one-arm handstand!’ ” recalled the 40-year-old during a recent interview. It would be one of many moves Nock would master, not only carrying on the tradition of his Italian and Swiss ancestors but creating a niche within the circus world. 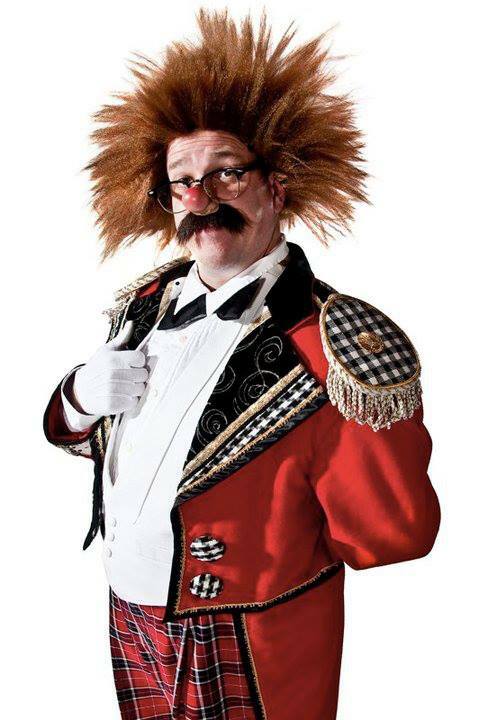 And now, after nearly a decade as the “star clown” of Ringling Bros. and Barnum & Bailey Circus, Nock returns home as headliner for this year’s Circus Sarasota, which premieres Friday and runs through Feb. 22 at the big top across from Ed Smith Stadium. “There is a story with everything I do,” he said. Like the day Nock first discovered how to separate his performances from other circus folk. Even his more talented kin. 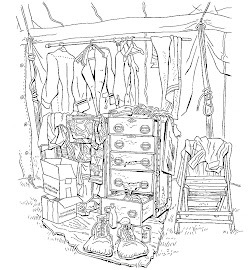 During another grueling childhood training session with his father and three older brothers — this time on the high-wire — Nock noticed the encouragement his father gave his siblings. “I wanted to get a better reaction, so on my first step I became a klutz on purpose,” Nock said. Maybe the reason Eugen Nock was proud of his baby boy that day was witnessing the embodiment of seven generations of circus performers on both sides. In fact, Nock’s circus roots run so deep his ancestors founded Switzerland’s Circus Nock in the 18th century. Eugen Nock arrived in America in 1954 to work for Ringling Bros., where he met Aurelia Cannestrelli, the daughter of Italian circus performers also with the show. The two married a year later at St. Martha Catholic Church in Sarasota, eventually having four sons. The two veteran performers couldn’t have been more opposite, with Eugen performing the sway-pole, and Aurelia as an acrobatic ballerina. 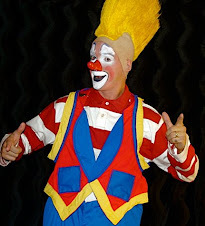 So from the start, Bello Nock incorporated his mother’s theatrical flair and his father’s daring stunts. “It was like having one foot in yesterday and one foot in tomorrow,” he said. 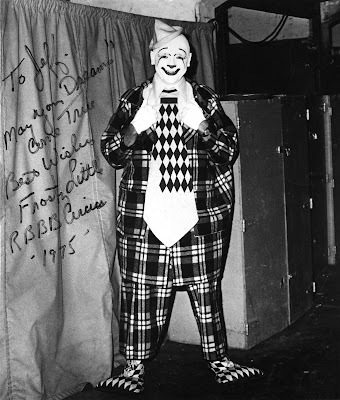 Nock started performing at 3, playing the baby in the burning house in a clown routine. By 6, he was playing Michael Darling in a touring version of “Peter Pan” with actress Cathy Rigby traveling around the world several times. “I was taught at a young age that nothing is impossible,” Nock said. When he wasn’t performing, traveling and practicing, Nock palled around with his Sarasota friends, first at Tuttle Elementary and later Sarasota Junior High. Favorite childhood jaunts included Sarasota Lanes, Stardust Skate Center and Sarasota Square Mall, he said. Although it would be years before fans would know Nock by his trademark hair, he found other ways to get noticed. It is those early memories that make Sarasota a special place for Nock, who lives here with his wife and their three children. “Sarasota is not this small town, and it’s not this big city; it’s right in the middle,” Nock said. And that’s after decades performing at arenas around the globe, becoming a worldwide sensation with dangerous feats like hanging upside-down from a trapeze connected to a helicopter circling the Statue of Liberty. 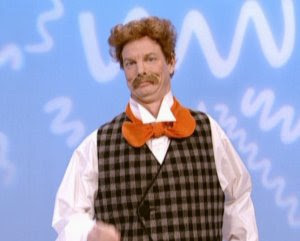 In 2001, Time magazine named Nock “America’s Best Clown,” a moniker that was both gift and curse inside and outside circus circles. 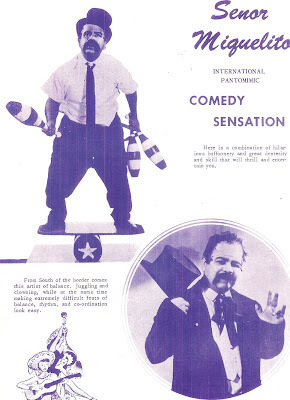 As Nock merged clownish shenanigans and daredevil acts, the label became burdensome. “Working at a place or in a show with many other clowns, I felt it being disrespectful if they introduced me as ‘The Greatest Clown’ or ‘The King of Clowns,’” he said. For Nock, the label is simple: He is not a clown but a comic. “I’m Jackie Chan and Jim Carrey together,” he said. And like most superstars, Nock has a physical distinction that overshadows any of his venturesome stunts. Nock gained his most unusual trait at 11, while working a water ski show at a popular water park. He and his brothers decided to get crew cuts to make it easier to manage their hair while getting in and out of the water between routines. Nock let his hair grow and grow and grow. And before he knew it, there was a column of red shooting up from his scalp. With traditional white-face, sparkling bowtie, and flashy suit, hair, charisma and stunts, Nock quickly became the face of Ringling Bros. and Barnum & Bailey’s Circus. 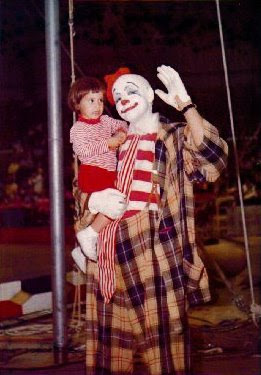 During his eight-year run as the top clown, Nock was able to entertain just about anyone buying a circus ticket. Nock’s performance philosophy or view of the circus is not a surprise, given his pedigree and experience. Now a “free agent” no longer obligated to Ringling Bros., Nock is home, joining world-class aerialists, animal trainers, illusionists and jugglers at Circus Sarasota. Circus Sarasota starts at 7 p.m. Friday through Feb. 22 at the big top adjacent to Ed Smith Stadium, at 12th Street and Tuttle Avenue, Sarasota. Cost is $10-$47; free for children under 2. 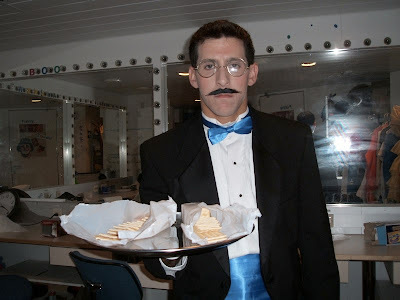 355-9335; circussarasota.org. OK, that's Fumagalli and Daris. Are the other performers their sons? Although Frosty autographed this photo in 1975 it looks as though it's from a few years before that. I wonder what is up with the "incomplete tie design" idea? I first met Frosty In 1968 when he was performing in Orlando Florida with Ringling Bros. We had 1st row center ring seats that night and my oldest daughter Mandy was about a year and a half old. He came over and picked her up taking her into the center ring. I am sending the photo I took of them that night. The interesting part of the story is that sometime in the mid 90s when he was in Miami I took a larger photo that I had and when I asked one of the other clowns about him he immediately went and brought him over. I showed him the photo and he remembered the exact time and place that it was taken. This has been a cherished possession since that time. 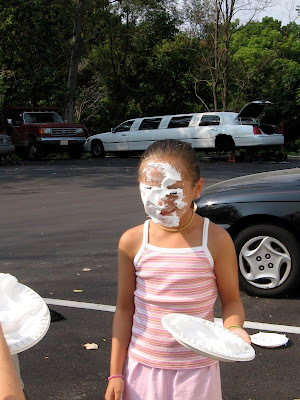 I grew up as a kid going to the circus every year and really miss the old time performances. If you can, pass a hello along for me. "If you know that someone is speaking badly of you behind your back, and if you react to that negativity with a feeling of hurt, then you destroy your own peace of mind. One's pain is one's own creation. One should treat such thing as if they are wind behind one's ear. In other words, just brush them aside. To a large extent, whether or not one suffers pain depends on how one responds to a given situation. What makes a difference is whether or not one is too sensitive and takes things too seriously." We had snow here today but it has started to rain. I don't think we'll get to go sled riding today. What did you have for breakfast? I had oatmeal. I've posted this one before but since we've been talking about "coat come to life" gags this one bears repeating. It's one of the very, very best. Please click the title of this post to be taken to Ms. Lenert's website. 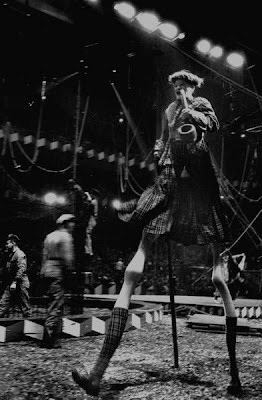 Harry Nelson walking stilts at Madison Square Garden in 1953. The beautiful classic whiteface and Earl Shipleyesque auguste of Roy Barrett. 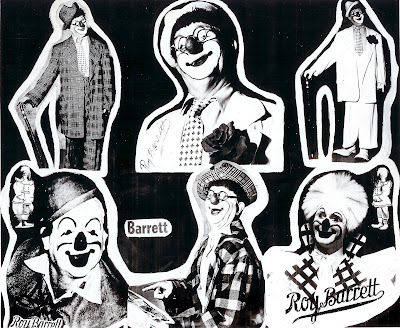 Barrett, I am told, lost his standing within the professional circus clown community when he went way over the top in cruelly chiding Otto Griebling in the alley of a Shrine date about Otto's painful divorce from his first wife Hanna, who he still loved very much. Otto took the high road and sat in silence as Barrett took great delight in mocking him. The rest of the alley was so appalled by Barrett's behavior that they shunned him for the remainder of the Shrine date and he saw his circus bookings dwindle down to nothing as word of his unprovoked viciousness spread. I never met Roy Barrett, so I have no first hand knowledge of him. It's unfair to judge his entire life and career by a single second hand account of one incident but that's the only story that I have on him. I'm eager to hear any other, better stories about Roy Barrett anyone out there might be willing to share. 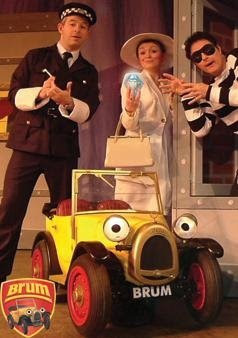 I don't know anything at all about Senor Miguelito other that I have his rola-bola act on an episode of Super Circus. I'll try to post it here this week. Anyone know anything about the Senor? 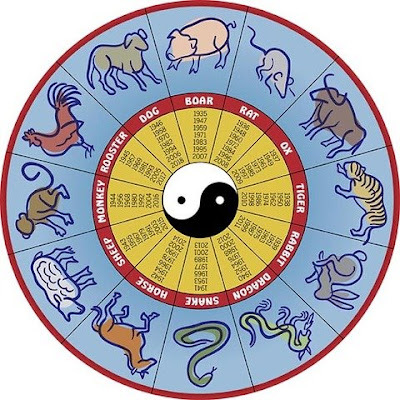 "The creatures that inhabit the earth - be they human beings or animals - are here to contribute, each in its own particular way, to the beauty and prosperity of the world." I grew up watching the 1970s revivals (or repeats) of 1950s and 60s TV clowns like Bozo, Clarabelle (from The Howdy Doody Show), the Town Clown (on Captain Kangaroo) and Soupy Sales. Here in New Jersey we also got Floyd Vivino and pals on WWHT Channel 68's The Uncle Floyd Show. So, if you've got pre-schoolers or kindergardeners at home, set your TiVOs! I have the feeling that the essential comedy of this effect might be better served if the "puppet" character were a baby or a monkey on his hip rather than a coat come to life. That's just my feeling. There are a few people doing "coat come to life" gags, some of them extremely well. I'm just thinking of how this might work with a different spin on it. Anyone else have any ideas? 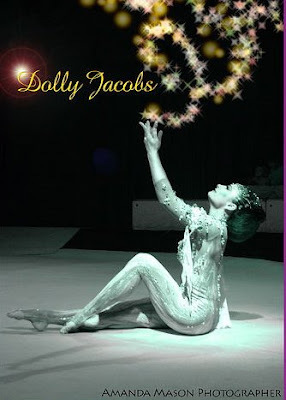 Happy Birthday to the Queen of the Air, Ms. Dolly Jacobs-Reis. This walk-around never looked so good as when Bumpsy did it. In my opinion however, the best walk-around Jerry produced was the Ostrich, with the revolving barber pole neck, & the monkey on it's back. 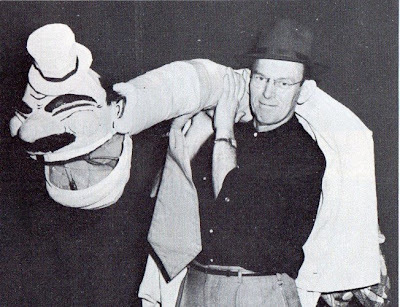 The problem with his props was that some were absolute torture for those who had to wear them, I did the Ostrich a couple times, I sure wouldn't want to do it a whole season. "Whenever Buddhism has taken root in a new land there has always been a certain variation in the style in which it is observed. The Buddha himself taught differently according to the place, the occasion and the situation of those that were listening to him. So, all of us have the great responsibility to take the essence of Buddhism and put it into practice in our own lives. Share your knowledge. It's a way to achieve immortality." I finally met Pete Geist on Saturday at the Pennsylvania Fair Convention in Hershey. Very nice guy! Click the title of this post to see two of my juggling students at Michael Rosman's Circus Camp, Sophia and Ethan Rosman, on last Monday's episode of Ellen.